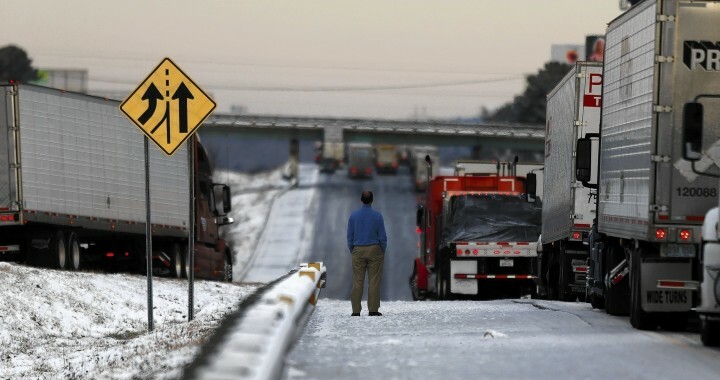 Last week in the metro Atlanta area, snow and ice turned city roads and interstates into parking lots. It was chaos, and not in the good, chaos theory kind of way. The brunt of the criticism was directed towards the school districts. Many students had to spend the night in the schools because the roads were impassable. Many students were stuck on buses because of traffic and road conditions. This was indeed a failure of leadership at the district level. Teachers, janitors, paraprofessionals, and local school administration were heroes: cooking meals, calming students, and watching over thousands. They deserve medals. The administration of these school districts are good people, with no intention of putting students, teachers and staff in life-threatening situations. But when faced with a bad decision, most administrators followed the bad decision with bad crisis management. At issue was their leadership, especially in crisis and chaotic situations. We all make mistakes, and as leaders, we all will fail in our decision-making. How we respond to those failures, however, will reveal our true character and leadership skills. So how do we respond to a leadership failure? One problem throughout snowmagedon (or snowgate or snowapacolypse as it has been called) was the overall lack of communication. The school districts were communicating with each other and with local and state law enforcement. But they did not effectively communicate with parents, if at all. In the midst of the crisis, many parents didn’t know where there students were. Were they still in the school or were they able to get on a bus? If they were on a bus, where was the bus? Local school administrators could answer the first question in most cases, but only the district administration could answer the second. Many parents had to learn where their children were from the students who had cell phones or whose teachers let them call from the school phones. Many parents, themselves were stuck in traffic or on impassable roads, did not know if buses were going to run at all. But even in the midst of the crisis, leaders should immediately be communicating with those most affected. Resources should be deployed to use every tool possible, from texts, email, social media and local media outlets to keep everyone aware of what is happening. People can handle bad decisions but what they can’t handle is the unknown, especially when it involves someone they love. One superintendent publicly admitted he failed. Others simply stated they did the best they could with the information they had. Strong leaders accept responsibility for their own leadership failures, and also for the failures that occur on their watch. They don’t dismiss or deflect responsibility, even for those other under them. The first apology should be to those affected the most, which in this case would the parents, students, teachers, school administrators and school staff. And every tool available should be used. The first contact should not be the local media, unless that is the ONLY way to communicate. Send an email or text, or pick up the phone and make a call if it is possible. Let your communication reveal what you were thinking, “This is the information I had and here’s what I was thinking…” If people can understand what you were thinking and why you made the decision you made, the fallout might be minimized. But you owe the people most affected the reasoning used to make the decision you made. Do a data dump while explaining the context of the data. Reveal everything unless it requires a security clearance or involves trade secrets. Were you contacted by someone with expertise who had information you ignored? Did local law enforcement contact you with information that you ignored? Was information collected by those you lead ignored or not passed up the leadership chain so that if could be combined with other leadership to make a better decision? Communicate that while other information may come out, this is what is known at the moment. Make all that clear. Be transparent. Share what you knew. And do not dismiss someone publicly for your rejection of their warning. Some superintendents in the area would not take questions at all. Some would not go on the record with answers. Not answering questions adds to the perception that you are not an effective leader. It also creates the perception that you have something to hide. Regardless of your political views, one of the reasons Governor Chris Christie of New Jersey survived early criticism of “trafficgate” in 2013 is that he stood in the midst of reporters for over an hour and answered every question. He did not dismiss questions or the reporter who asked it. And in that moment he looked like a leader who knew a mistake was made but was taking responsibility for that mistake. Make direct contact with those who excelled in the face of your failure just after you make direct contact with those who deserve your apology. Let them know your gratitude. Tell their stories to anyone who will listen, and tell those stories often. This reveals that you know who acted in the face of failure and what they did. It shows that you know what really went on in the midst of your lack of leadership and that despite what happened, you are not out of touch. If you do not know what you would do when faced with a similar situation, be honest about it. But tell them you will develop a plan and reveal that plan as soon as it is complete. And follow through with sharing the plan. 10. After the effects of the failure are over, get away for a period of time and reflect on what happened. Journal your thoughts. Figure out why you really made the decision you made. Often, our decisions are made because of past events in life, pride, fear, or anger. We don’t initially take those into consideration and in fact, they may even be evident until we did deeply into our own heart. Be open and honest about your time of reflection. This reveals self-awareness and creates the opportunity to grow as a person and as a leader. Don’t assume you will survive this failure, or in some cases, that you should even survive. Every decision, good or bad, has consequences. In instances where the failure was egregious, it may be that you should be removed from your position. It may also be that you may need time off to recover emotionally, spiritually, or physically, and in that case, you should resign. Learn from your failure and develop a plan to handle crises in the future. How would you communicate? How would process information? Who would you listen to? Leadership failure creates a crisis and you do not need to let that crisis create a unnecessary chaotic environment. Chaos results from a lack of leadership and planning. Effective leaders have a process in place, even if it is in their heads, and execute that process immediately and decisively. Even if the process is wrong, it shows that you were forward thinking enough to have a plan. We will not always make the right decision. But when we make the wrong decision, how we respond reveals the strength of our character and the level of our leadership. Hopefully, these actions will allow you to make better decisions in the future, and handle crises more effectively. Q4U: What would you add or subtract from this list and why?